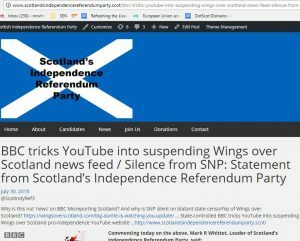 SCOTLAND’S INDEPENDENCE REFERENDUM PARTY is the ONLY political party to issue a statement on this issue – which is at the heart of the Scottish Independence debate and also at the heart of the issue of (mis)trust in the BBC. The primary goal – and number one objective in the constitution of Scotland’s Independence Referendum Party – is to achieve political Independence for Scotland. We aim to do so by helping to bring about a new/ second Scottish Independence Referendum in light of the entirely-changed political and constitutional landscape following the UK Brexit vote. We shall do this by providing a meaningful, valid, SECOND choice/ chance to vote for Independence-supporting MSPs in elections to the next Scottish Parliament; ie SNP party members/ voters can vote ‘first’ choice for SNP on the ballot paper, and then vote ‘second’ choice for Scotland’s Independence Referendum Party on the ballot paper. This gives two choices/ chances/ votes in favour of Scotland’s Independence (instead of the present 1/ SNP – and reduces the ‘stray’/ use-less ‘second’ vote going to any other British Unionist party. Despite the use of the word ‘Scottish’ in front of their names, the Liberals, Tories and Labour are all single, British Unionist parties and are all controlled from, and based in, their London head offices. Scotland’s Independence Referendum Party is not competing with the SNP; rather, we want to work in a progressive alliance with them and all other groups that support Independence for Scotland. 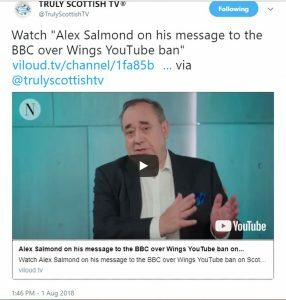 Tags: BBC bias, censorship, Salmond, Scotland's Independence Referendum Party, Whittet, Wings over Scotland, and You Tube.